Horace is a single-author blog theme for Ghost. Featuring a minimal, slick, responsive and content-focused design. Horace is a beautiful, minimal single-author blog theme for Ghost, made to put content in the first place, without any clutter, distraction and noise. 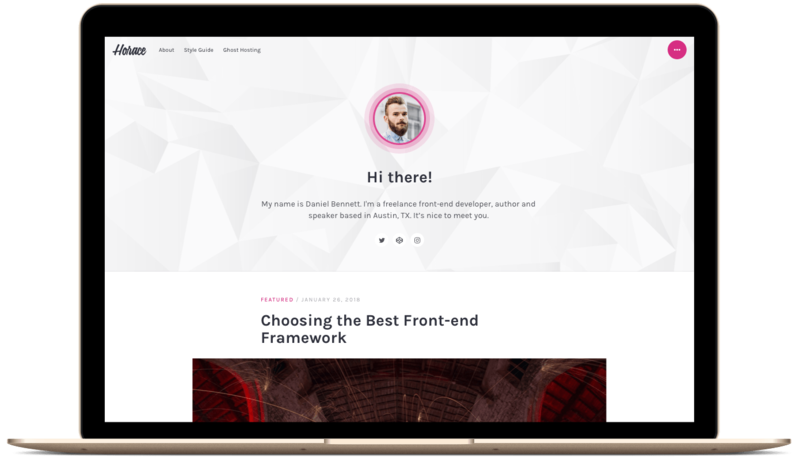 Horace is ideal for developers who want to start blogging about code quickly (it has Prism syntax highlighter included), writers who are looking for a content-focused theme to share their ideas or content marketers who want to have SEO optimized blog with well-integrated sharing experience. This theme will serve you well. Download Horace today! You will regularly get theme updates with new theme features and bug fixes. Also, we make sure that the Horace theme is compatible with the newest Ghost version. Horace features a responsive design, that means your site will adapt smoothly to any screen size from desktops down to mobile phones.